In Mumbai, you find all sorts of contrasts. The very poor, dressed in thin gaudy saris walk next to the wealthy Mumbai elite who emulate western culture with tight jeans and dinner dates at American styled coffee shops. Opulent malls sit side by side with corner cafes and apartment blocks that look ready to fall to pieces. On our first evening – a Saturday – we head to the beachfront. The sun is sinking behind a cloud of dust and pollution so thick, that the entire sky appears orange. The beach is packed with locals enjoying the slight breeze off the ocean. Couples sit together on the sand. 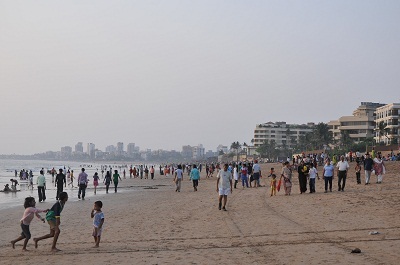 Families pose for photographs in the small shore waves and hundreds of hawkers stroll the shoreline selling ice cream, kites and balloons. Yet, even with the volume of people out on the beach and the endless high rise buildings and dirty, narrow roads that lead onto the beach, the atmosphere is fantastic. Everyone seems in good spirits, laughing and chatting. Playing cricket in the sand and taking advantage of a balmy evening as the sun sets. But, despite the fact that there were a couple of children playing in the surf, I don’t think that I would venture even a toe into the ocean as it is likely filled with rubbish and human filth. It seems quite amazing that in such a wealthy city, (they produce 40% of India’s GDP) everyone still throws their rubbish onto the streets and the rivers run black with filthy, reeking water. Staying only about an hour’s train journey from the centre of Mumbai, it seemed like a good idea to jump into the thick of things and take the local train from Andheri station to the popular tourist area of Coloba. A half hour rickshaw journey takes us through the dusty and busy roads and we find ourselves at the station. Stalls selling fruit, books, clothes and food line the road while rickshaws jostle for customers. The station looks like it hasn’t changed much in many years. I have never been to a local train station before, and while there are some signs in English, I have no real idea where to go and how to proceed. But, I join the long, quick moving queue and wait. Suddenly the counter window in front of our queue shuts, and everyone in the queue quickly takes two steps to the right and merges with the next queue. It happened so fast, and somehow I managed to get myself a spot. Surprisingly quickly, we are at the counter and buy two tickets to Churchgate station. The cost? Rs 16 ( about R1.50 each) for a 30 minute train ride. Public transport in India is very cheap compared to prices elsewhere and is also very efficient. While the Western Railways line in Mumbai didn’t seem particularly modern, the trains run efficiently, on time and make getting around the city very easy. One of the great things that I notice about the public transport, is that there are concessions made for all sorts of different sectors of society. On the local train, there are “ladies only” coaches ( which was great for us two ladies travelling without a male chaperone! ), “senior citizen” only coaches and then, very interestingly, there were also coaches reserved for disabled persons and cancer patients. There is something so special about the layers of respect for different groups of society who they know have a hard time. On a similar note, throughout India, the people help disabled people by giving alms to the many disfigured and struggling people who ask for money on the roads and at stations. I was terribly embarrassed when, while sitting in a rickshaw waiting for the lights to change, an old disabled man asked for money, and our driver passed us Rs2 to place in his cup! While it is quite disconcerting to be constantly asked for money, mostly by very poor children, I felt so small minded by not giving over a few coins to that old man. So, we had our tickets and headed to the platform and so began the terrible train trip number one. Being the first time that I had ever negotiated the local train network, I was understandably a bit anxious. Thankfully it was a Sunday and there were not too many people on the station. But, we were not sure where to sit! We first got aboard the first class coach by mistake, to be told we were on the wrong coach by one of the well dressed ladies sitting there. At this point, I didn’t know that there were ladies only coaches and so we tried to get on the “man’s coach”. Again we were told to head further down the platform and eventually we get to the much busier ladies only coach for the average Indian. I hop on and as I do so… the train begins to move. This is a scene with all the markings of “holiday gone wrong” moment. My mom was just a step behind me, but the train had already begun to move and next minute, she is hanging on the train railing while myself and another women haul her into the compartment. Someone must have seen something, because the train comes to a stop and a young hawker comes running towards us with the ticket that was dropped in the rush. That could have ended very, very badly. Somewhat shaken up, we sit done and a woman on the train kindly tells us, “Don’t worry, you never have to run for a train. There will always be another one. Rather wait for the next one than try to get onto the train.” We didn’t know just how frequently the trains departed, but learnt a good lesson. If you miss a local train, just wait for the next one. In any case, the disaster was avoided and once we were settled we could enjoy the ride. The train we were on was obviously a nice new one. Later train trips in Mumbai were on old, dark and dirty trains where we were crammed into the coaches, and had to watch the stations anxiously to be sure that we got off at the right place. But, for now, we both had somewhere to sit and the stations were announced in Hindi as well as English over the onboard announcement system. We were on our way to Churchgate – the nearest station to the popular tourist area of Coloba.